Sit on floor with knees bent, feet flat, holding a dumbbell in each hand by hips, palms up. Lean back 45 degrees and lift feet (shins parallel to floor). Maintaining V-sit, curl weights to shoulders; press weights overhead, rotating arms out to a goalpost position and then extending them toward ceiling, palms facing forward. Reverse motion to lower weights to start. Stand with feet shoulder-width apart, holding dumbbells in front of thighs, palms facing forward. Quickly curl weights to shoulders, then, keeping elbows close to sides, rotate bent arms out to sides so that arms form a W with palms facing forward. Rotate arms back to curl position, then lower. Do 10 reps.
Next, do 10 full biceps curls, quickly lifting weights to shoulders and then slowly lowering them to thighs. Finally, start with elbows bent 90 degrees by sides, forearms parallel to floor. Quickly curl weights nearly to shoulders; lower to 90 degrees. Do 10 reps.
Do series 3 to 4 times. Lie faceup on floor, knees bent and feet flat, holding dumbbells with arms bent by sides so that forearms are perpendicular to floor and palms face each other; lift hips (bridge position). Maintaining bridge, do a chest press, extending arms straight up and then lowering them. Repeat press 2 more times. At top of third chest press, keep upper arms steady and bend elbows to lower weights by ears. 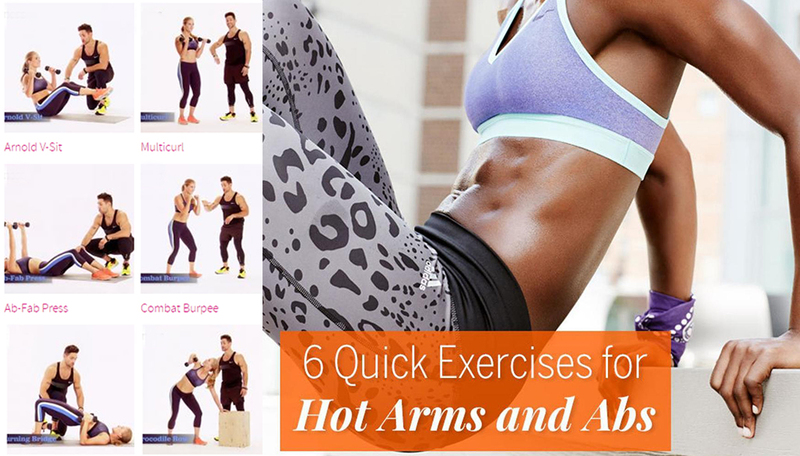 Extend arms upward again and repeat 2 more times. Lower arms to start. Complete series 4 to 6 times. Holding a dumbbell in right hand, stand with feet staggered wide, left foot in front of right, and hinge forward to place left hand on a bench or chair seat. Reach right hand down to outside of left shin (right shoulder faces left). Drive right elbow behind you, simultaneously rotating body so that chest faces right and dumbbell is by ribs. Reverse motion to starting reach. Do 15 to 20 reps; switch sides and repeat. Lie faceup on floor, knees bent and feet flat, holding dumbbells with arms extended toward ceiling, palms facing each other. Keeping arms extended, engage abs and sit up tall with arms overhead. Bend elbows to lower weights to shoulders, then press weights overhead. Slowly lower to start position. Do 12 to 20 reps.
MAKE IT EASIER: Perform reps without the weights. Jump feet back into plank position, then do a push-up. MAKE IT EASIER: Skip the push-up.